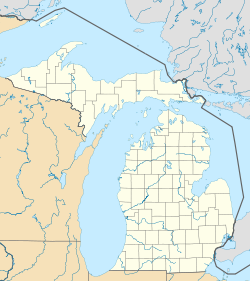 West Bloomfield Charter Township is a charter township in Oakland County in the U.S. state of Michigan, within the Detroit metropolitan area. As of the 2000 census, the township had a population of 64,860. As of 2008, West Bloomfield Twp was ranked the 8th highest income city in america with a population of at least 50,000. In the metro area, it is widely known for its large homes and rolling hills. The school district serving the majority of the town is the West Bloomfield School District. West Bloomfield is sometimes referred to as the "lake township of Oakland County" being heavily dotted with small and medium-sized lakes. Cass Lake, the largest lake in the county, is in part of West Bloomfield, and Pine Lake, which has a private country club on its shore, is only a few miles away from Cass and lies completely within West Bloomfield. In addition, directly west of Pine Lake is Orchard Lake, which also has a private country club on its shore. Orchard Lake is surrounded by the city of Orchard Lake Village. Several smaller lakes are scattered around these larger ones. It is known for being very wealthy. Orchard Lake Road runs north-south through the middle of the township and is the main artery of West Bloomfield's economy, flanked on each side by long strip malls and shopping complexes. Most of the township's population growth has occurred since the 1960s, as many residents moved there from the inner ring Detroit suburbs. West Bloomfield is located in south-central Oakland County about 10 miles (20 km) to the northwest from the Detroit city limits and has borders with: Bloomfield Township to its east, Farmington Hills to its south, Commerce Township to its west, and four communities to its north: Waterford Township, Orchard Lake Village, Keego Harbor, and Sylvan Lake. West Bloomfield High School and Jewish Academy of Metropolitan Detroit and Orchard Lake Saint Marys are the only three high schools located within the township. West Bloomfield schools are one of the top school districts in the country. West Bloomfield is known for its large Chaldean and Jewish populations. It is home to the Jewish Community Center of Metropolitan Detroit several jewish schools like the Jewish Academy of Metropolitan Detroit and the Frankel Jewish Academy and Jewish museum like the Jewish Historical Society of Michigan. On April 22, 1833, Bloomfield Township was divided in two and the western portion was called West Bloomfield. The area was spotted with apple orchards throughout much of the 1800s. In fact, the plentiful apple trees located on an island in one lake, led to the naming of the body of waters as Orchard Lake, and the aforementioned island as "Apple Island". According to the United States Census Bureau, the township has a total area of 31.2 square miles (80.9 km²), of which, 27.3 square miles (70.8 km²) of it is land and 3.9 square miles (10.1 km²) of it (12.49%) is water. The U.S. Census Bureau has also defined West Bloomfield Township as a census-designated place (CDP) in the 2000 Census so that the community would appear on the list of places (like cities and villages) as well on the list of county subdivisions (like other townships). The final statistics for the township and the CDP are identical. In the township the population was spread out with 26.4% under the age of 18, 5.2% from 18 to 24, 27.1% from 25 to 44, 27.9% from 45 to 64, and 13.4% who were 65 years of age or older. The median age was 40 years. For every 100 females there were 96.8 males. For every 100 females age 18 and over, there were 92.9 males. According to a 2007 estimate, the median income for a household in the township was $98,832, and the median income for a family was $113,191. Males had a median income of $74,557 versus $45,339 for females. The per capita income for the township was $44,885. The township is often regarded as one of the most affluent in the country. About 1.6% of families and 2.7% of the population were below the poverty line, including 3.0% of those under age 18 and 2.6% of those age 65 and over. ^ "West Bloomfield Described," Greater West Bloomfield Historical Society, Accessed June 23, 2007. West Bloomfield Township information and census data. This page uses content from the English language Wikipedia. The original content was at West Bloomfield Township, Michigan. The list of authors can be seen in the page history. As with this Familypedia wiki, the content of Wikipedia is available under the Creative Commons License.